Prevalence of blood groups among different ethnic groups have variation in different part of the world. There is no published data about the prevalence of blood groups in Maldives. 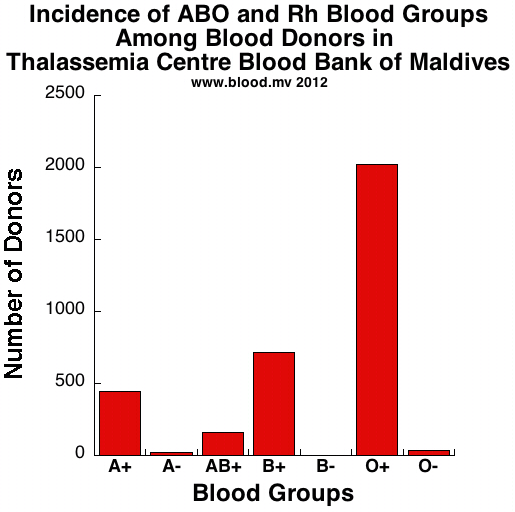 The data shown here is the incidence trend among blood donors in blood bank at Maldivian Blood Services. As expected O Rh+ blood group is most common blood group among Maldivians. Maldives is a world ‘hot spot’ for thalassemia. The prevalence of b-thalassemia in the population of this country is 18.1%; 1 in 5 people are carriers of the disease and 1 in 120 live births are estimated to be thalassemia majors. Currently, there are more than 700 thalassemia major patients who require regular blood transfusions, and as a result, 60% of the blood utilization of the Maldives treats these patients. 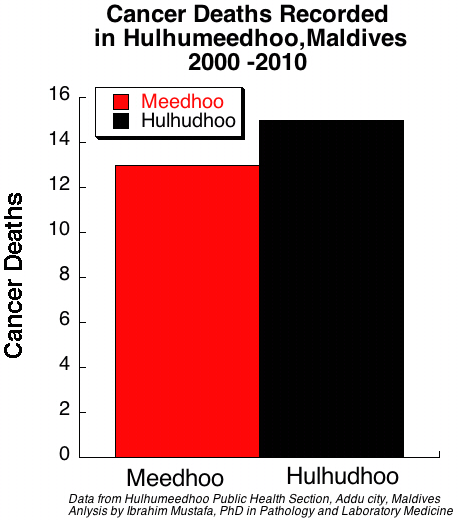 Cancer is alarmingly increasing in Hulhumeedho for the last decade the data shows. Cancer awareness workshop held in Adducity Hulhumeedhoo on 22-23rd June 2012. The target audience was women of age group 21-45. The areas covered on this workshop were introduction of cancer, and common predisposing factors for cancer. Major areas covered among most common female cancers were cervical cancer, uterine and breast cancer. The Maldives has one of the highest incidences of ß thalassemia in the world. Treatment of ß thalassemia is characterized by two distinct phases: treatment of nature’s disease (anemia) and the secondary treatment of transfusional iron overload, a side effect of our cure. Interestingly, excess iron may also exert a negative effect on immune competence thus explaining the recurrent bacterial infections in these patients. Current iron chelation therapy using DesferalÒ (DFO) is challenging due to its short vascular half-life, frequency of injections, toxicity and expense. To address this problem, we have tested novel, low toxicity, high molecular weight (HMW) iron chelators. The utility of these chelators was tested in vitro using iron loaded (0-500 μM ferric (Fe3+) ammonium citrate, FAC; 0- 48 hours) HepG2 and dendritic cells (DC). 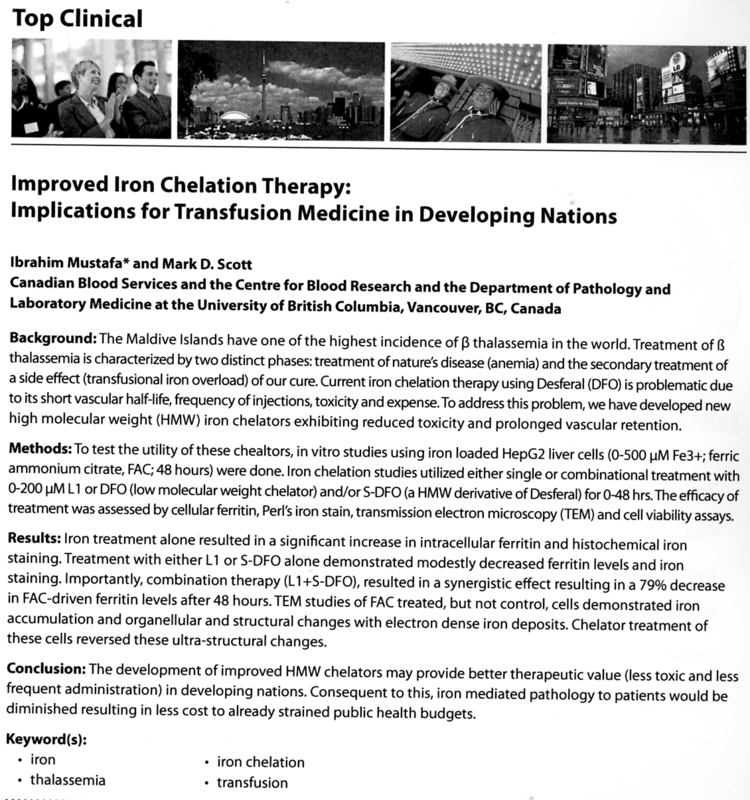 Iron chelation studies utilized either single or combinational treatment with deferiprone (L1) or DFO (both low molecular weight chelators) and S-DFO (a HMW derivative of DFO) for 0-48 hrs. The efficacy of treatment was assessed by cellular ferritin, Perl’s iron stain, transmission electron microscopy (TEM), antigen presentation assays and cell viability assays. Iron treatment alone resulted in a significant increase in intracellular ferritin, histochemical iron staining and also resulted in a ~65.2% reduction in PBMC proliferation in response to the tetanus toxoid following 14 days of incubation. Treatment with either L1 or S-DFO alone demonstrated modestly decreased ferritin levels and iron staining. Importantly, combination therapy (L1+S-DFO), resulted in an additive effect resulting in a 79% decrease in FAC-driven ferritin levels after 48 hours and TEM studies of FAC treated, but not control, cells. FAC treated cells also demonstrated organellular and structural changes with electron dense iron deposits. As hypothesized, iron chelators (e.g., 200 μM DFO or L1) restored the PBMC proliferation in a concentration dependent manner and reversed the ultra structural changes in organelles. The development of HMW chelators may provide better therapeutic value (less toxic and less frequent administration) in developing nations. Consequent to this, iron mediated pathology in patients would be diminished resulting in less cost to already strained public health budgets such as in Maldives. Maldives is a country with a distinctive geography that portrays a model of a small island nation. The total landmass of the 1190 small islands of the country is less than one percent of its national territory. Population of the 200 inhabited islands varies considerably. The country’s 2000 population census shows a total of 270,101 people living in the country. Origins of the Maldivians are not very certain. However, it is believed that the history goes as far back as BC 1000. Early settlers were travelers on the Silk Route, and from the Indus Valley Civilization. The Maldivians are innately warm, friendly and generous by nature, and anyone can easily establish a casual conversation with the Maldivians. It is believed that the genetically inherited heterogeneous disease “Thalassaemia” have been imported to Maldives through traders’ route, how ever there is no scientific evidence to prove this, or the gene is due to a mutation in the midst of Maldivian population. The earliest case of Thalassaemia diagnosed goes back to early 1970s. During 1970 – 1980 few cases registered in Government Hospital where there was no proper regimen for transfusion and proper management of this disease. During 1980 -1990 there was dramatic increase of Thalassaemia patients in the country, due to this special clinics for these patients were been made in the paediatric ward of the hospital. The impact of Thalassaemia and its social stigma has been recognized by the government and many experts from various countries have been brought in collaboration with WHO during 1980s. Ever since 1992 one of the leading NGO in the country ,Society for Health Education (SHE) working towards well being of Maldivian’s health has started one of its essential element, Thalassaemia Prevention Program, comprising ,health education , population screening and genetic counseling .During 1993 National Thalassaemia Program has been formulated and in December 1994 National Thalassaemia Centre has been inaugurated with 17 beded ward , blood banking facilities and a diagnostic laboratory services. The enormous contribution of many people in both Government and NGOs across the country, thalassaemia awareness has increased dramatically and now the word thalassaemia is a house hold story amid all the alliance of communities. The combine effort of these institutions has screened thalassaemia and other hemoglobinopathies over 30 % of the entire population in the archipelago using modern diagnostic methodologies, including hemoglobin electrophoresis, automatic cell counting and quantification of hemoglobin. Some collaborative studies has been done with International Thalassaemia Research Institutions abroad, such as molecular defect of Beta Thalassaemia in the Maldives has been studies and their prevalence has been identified (74% being IVS 1 – 5 G – C ) ( Journal of Hemoglobin 1998, Fucheron et al ). This knowledge has contributed and paves the way to guiding principle for the prevention of thalassaemia for the sustainable development of health sector in the country. Around 18% of the Maldivian population is found to be carriers for hereditary blood disorder, beta thalassaemia. This prevalence level leads to a birth of a thalassaemic child (thalassaemia major) for every 120 births. At the end of the year 2002, nearly 504 thalassaemia majors were registered at the National Thalassaemia Center. It has been estimated that for the eight-year period 1990-1998 more than 50% of the Thalassaemic children born in Maldives would have died in infancy or before their third birthday. Due to the impact of emerging issues of thalssaemia and its impact to the community directly and indirectly, a six year National Thalassaemia Program has been formulated, many areas have been highlighted and it’s on the way for implementations. This includes, population screening, thalassaemia education, prenatal diagnosis (PND) and research. In near future PND can be done in Maldives with the establishment of molecular biology laboratory in the country. The couples at risk can be counseled and if they desire medical termination of pregnancy (MTP) can be recommended. 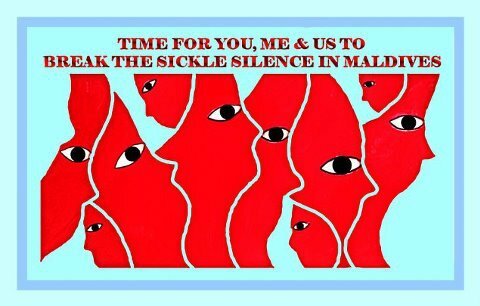 Screening for thalassaemia, as well as treatment of thalassaemics, is costly but at the moment it’s free in the Maldives. Thalassaemic children require continuous and regular care and treatment to stay alive. They require monthly transfusions and treatment with the drug Desferrioxamine, injected five times a week. The annual cost of treatment exceeds US$6,000. At present only, Bone Marrow Transplant (BMT) ensures permanent cure for Thalassaemics. But the cost of this treatment ranks between US$30,000 and US$50,000. Due to the low income of average people, this costly treatment BMT cannot be afforded by many families. The perspective of Thalassaemia seems to be a successful story in Maldives, as it is integrating government and non governmental efforts to control thalassaemia in Maldives. A look at the expectations therefore indicates the need for a more comprehensive incorporated program to strengthen the existing agenda for the prevention of thalassaemia in Maldives. Note: This article was written on 2002 and published on Thalassemia Awareness Week supplement at Baqai Medical University. 6. 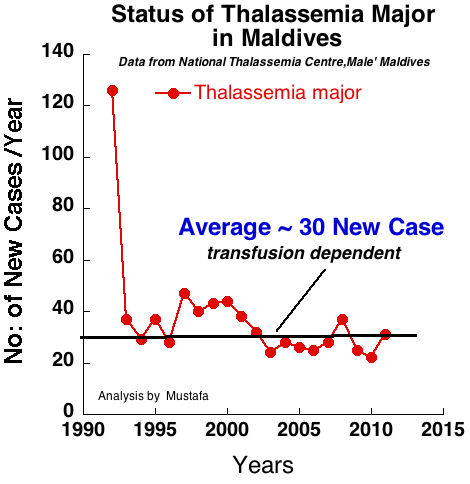 National Thalassaemia Program 2001 – 2006, Ministry of Health, Maldives.